Hammocks and hammock chairs are good investments and great places to relax while spending time outdoors. To get the most from these investments, protecting them from the elements is very important The easiest, most practical way to accomplish this is to invest in a Hammaka Chair and Stand Cover for your outdoor living area. 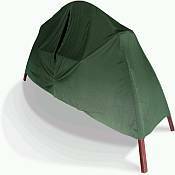 If you plan on leaving your hammock chair or hammock stand out while not in use, then a cover is a must. The most important thing to remember when purchasing a Hammaka Chair and Stand Cover is that it must be water resistant and UV treated so that your cover can withstand harsh winter weather. Hammaka covers are heavy duty and protect your stand from harmful UV rays and water damage, so that the beauty and strength of your hammock chair or stand is maintained. The covers are made from 190T UV 30 Nylon material and come in an attractive green color. Please click on the type of cover you are interested in below for pricing and more information.